The appearance and function of your office space can matter just as much as the running of your business, so it’s important to take care of this space and find ways of improving it. Having a well functioned and presentable office, can not only help with employee happiness but it can also raise the business’ productivity as a whole. So, use these tips to improve your own office space. Light is an important factor in a space because it has a direct impact on our mood. When you enter an unlit room in the morning, you feel sleepy right? Switch on the light and you are attacked with a bright burst of light that makes you wish you stayed in bed for an extra ten minutes. But walk into a room where there’s natural light and how does it make you feel? It helps you wake up gently, and the use of light should be thought about when lighting up the office. Take advantage of any natural light that hits your office and if possible, replace any small windows with big ones to let in as much of that happiness booster aka natural light, as possible. Natural light significantly improves our energy and productivity levels and can help employees stay on task for longer than they usually would. If natural light is a little difficult to source, look into different types of artificial lighting. Thankfully, technology in lighting has advanced to a point where we can now get lights that imitate natural light. So, there’s really no excuse! Color is also something that can play with our emotions. Walk into a plain grey colored room, where the walls, carpets and furniture are all the same color, and you’ll want to turn back around and walk straight back out. Too much color and we’ll find ourselves getting distracted and perhaps a little nauseous. Different colors can emote a variety of feelings so do a little research to pick out the best color schemes for the different areas, depending on what goes on in them. For example, using blue in a ‘work zone’ helps with productivity and using neutral colors in break out spaces can help employees relax and switch off. You should also try and use the colors that reflect your brand’s own colors. This adds a bit of consistency and helps those who walk past or enter the office, know where they are. Plants can have a massive effect on those working in the space and can also add a much-needed dose of color. As humans, we naturally want to be outdoors. Have you ever longed to be outside when the sun is out? Fresh air and being at one with nature is important so by bringing the outdoors inside; you’re getting the best of both worlds. Plants help improve the quality of air, reduce stress and boost creativity. It can also contribute to less sickness of employees in the office. Nature can help make a workspace attractive and inviting, which is important when you have clients or customers walking through your door every day. Why not consider a flower subscription service to minimize the effort and hassle of looking after plants? Metal Table Tops – Useful for when you own a restaurant or suitable in a space where your employees might sit down for lunch. Multi-Use Furniture – Side tables or sofa seating that lift up to reveal storage space. Multi-use furniture is great if money is tight and if your space is even tighter! Comfort is important when it comes to furniture that employees use daily, so invest in supportive chairs or standing desks to reduce any health problems further down the line. Yes, lowering the thermostat might save the business a little money every month but it might hinder your business’ productivity because your staff are too cold to do anything. Heat can actually make a considerable difference to an office space so be sure to put your health and your employee’s health first by being generous with the heating. Were you ever told as a kid that a messy room is a messy mind? Yes, it might mean that you’re a creative person or a genius but having a messy workspace isn’t going to benefit everyone. You might be running a business where lots of paperwork is involved, or you may be in hospitality, where dirty dishes are everywhere. It’s important that whatever space you do work in, is clear of mess and clutter. Work with employees to make the necessary changes that will help tidy up a space. Maybe there needs to be an extra dishwasher or two in the kitchen? Perhaps those folders and files piled up high on a desk need a cupboard to go into it. Especially in the current climate of GDPR, it’s crucial to keep certain documents under lock and key. When it comes to organizing a space and keeping it tidy, an example should be set throughout the office, so be sure that everyone, even those at the top, is doing their bit to keep the space clean and clear. Yes, you heard right, a signature scent can make a difference to the vibe of an office space. Who’d have thought it? Our sense of smell can have a very powerful effect on our mood and productivity. Why not add a scent or two to your space that not only helps improve the mood and productivity but also represents your company to the extent that if they smell it, they’ll think of your organization? Very clever! Some scents that are great for staying focused include pine, peppermint to lift your mood and citrus that wakes up the senses – great if you’ve got the Monday blues. Everyone works a little differently; some may thrive off a busy environment whilst others need a quiet space in order to focus. Think about noise levels when it comes to the office space and get the input of your staff to figure out a suitable environment that works for everyone. Noise cancelling headphones or temporary wall units can be handy if space is limited and there’s no way around reducing the sounds. You might want to also think about adding music to a space. Music can make working on tasks more bearable, especially if it’s one you don’t enjoy doing. For customers or clients walking into a business, the type of music you use will create a certain type of atmosphere. Classical or jazz music may automatically give off an impression that the organization is quite formal or classy. Pop or current chart music might hint at a more creative environment. So, think carefully if you want to add music to your office space. You want your workspace to reflect your business and what it stands for, so when improving your office space, think about adding a bit of character. 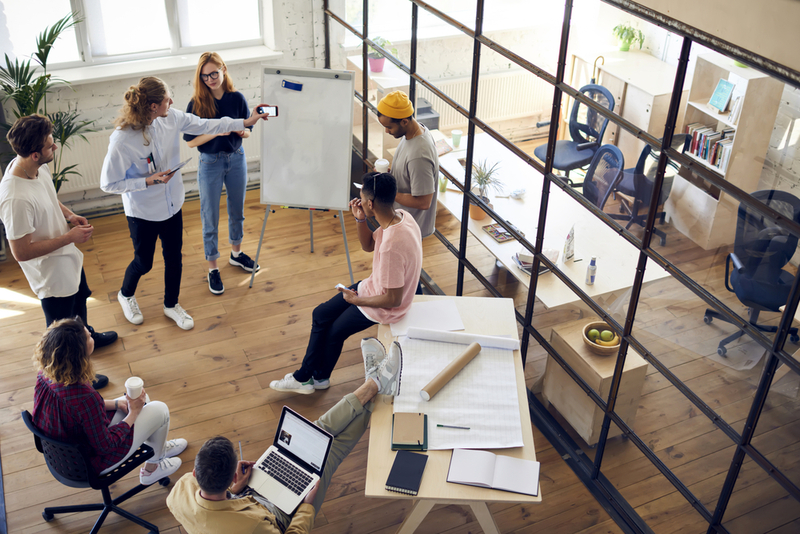 If you are a start-up business with a creative flair, perhaps you want to add in a few break out areas for brainstorming and group activities. If you run a business that covers the entertainment industry in some way, you might want to put up lots of artwork or posters that link in with who you represent or work with. Adding character to your space can say a lot about who you are as an organization so be sure to show that side of your business off throughout all the areas. Tablets that are wall-mounted to control lighting, heating and other utilities. Remote working for employees to help with an office space that might be a little cramped. Apps like Slack that allows direct messaging and file sharing amongst colleagues. Digitally storing files to cut down on stationery costs and storage issues within the space. Task management and monitoring software to keep employees on track can maintain productivity. Entry codes and turnstiles are great for keeping your office secure and off limits to the public. These are all great ways of how technology can improve your business. Improving your office space is not only important to your employees but to the overall running of the business. You want the space to represent and reflect your company in a positive light, so take care in your office appearance and the space will allow your business to grow and develop.